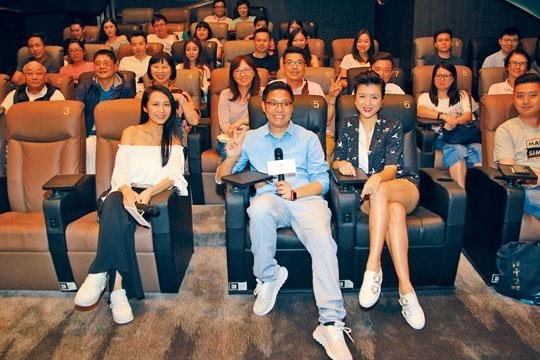 Aimee Chan Yan Mei and Kathy Yuen (Tong Yi) yesterday attended their film WHEN SUN MEETS MOON's audience appreciation event at a Central cinema with director Benny Lau Wai Heng. Aimee revealed that earlier she and husband Moses Chan Ho went to see the movie on their date night. Her husband praised her, especially for her crying scene. Aimee said that she was very pleased with that scene. "During the shoot I was too in character. In the end my emotions erupted and couldn't stop crying. Maybe after becoming a mother I had more life experience that was helpful to acting. Honestly I can do even better." Aimee hoped to be able to try different characters. Would she like to work on a film as a couple? She said, "I feel it won't be entertaining, but I won't keep it from consideration. The audience wouldn't be interested. Ultimately viewers watch movies for fantasy, anything too realistic would be like a reality show. (What about intimate scenes with other male artists?) It's OK in acting, depending on what the script calls for. (Would you be OK with playing a prostitute?) Sure, the most important is the script. I too want to have even more and different opportunities to challenge myself." Aimee also said that her husband has been very supportive of her. Because both are actors they understand that they can only perform their characters well without any burden. Has she enjoyed her husband's love scenes in previous films? She said, "No, I don't dare to. If I see him kissing another woman, I am afraid that I wouldn't be comfortable with it. Ultimately I am his wife, but I would respect his space in his career." Tong Yi said that the film's word of mouth and reviews have been better than expected. Last week at an audience appreciation event when she saw the good response she almost cried. She also revealed that Carlos Chan Ka Lok earlier after watching the film hug her and cried because the film reminded him of his first girlfriend. They broke up due to immigration. She said, "I have known Ka Lok for over ten years, he has never cried in front of me. I too felt a little awkward."